Nintendo fans have been holding Animal Crossing over our heads for generations, but no longer! Castaway Paradise is a new title for the PS4 that takes inspiration from this classic series, along with a few other titles that have been eating up our collective time lately. Does this mixture of various mechanics make for a title that fills that Animal Crossing-sized hole in your heart? Read on to find out! Castaway Paradise starts with your character in the midst of a storm on the open ocean. After your ship sinks, you wash ashore on an island paradise filled with animal citizens, though you yourself are very much human. After a quick opening tutorial that shows you the mechanics, Castaway Paradise leaves itself open to your whims. While I did run into a glitch during this tutorial, it has since been fixed in a patch that came out shortly after release. 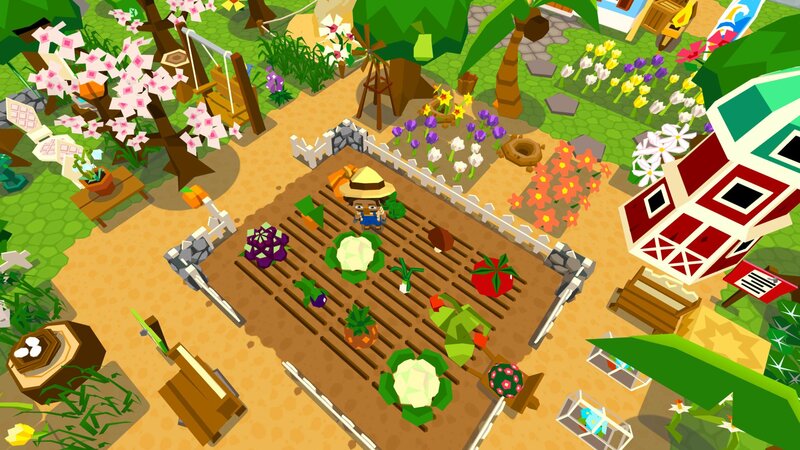 Castaway Paradise allows you to farm, fish, catch bugs, decorate your home, customize your character, play the stock market, and even do quests for the local townsfolk. Combine this with seasonal events, and it’s easy to see how the game has a solid foundation. In fact, these mechanics all play well together, making for a very addictive experience that ropes you in quickly and keeps you engaged pretty regularly. There’s an extended honeymoon period with Castaway Paradise that lasts well into the game’s initial hours. As you water plants, complete quests, and unlock more of the world to explore, you’ll quickly find yourself locked into a loop that is hard to break free from. In addition to all the activities, everything you do will add to your overall XP. As you level up, you’ll unlock new tools, decorations, and customization options for your character. With everything balanced, the game is constantly rewarding you at every turn, and it feels pretty great. There’s a huge selection of decoration and customization options for your character and house as well. You’ll soon have a place full of furniture, collectibles, plants, and anything else you want to decorate your home with. Playing daily also offers rewards as you play for consecutive days, which encourages you to come back and check in each morning or afternoon. While the other mechanics like catching bugs or farming are pretty basic, I will say the fishing minigame is the best combination of reflexes and luck that I’ve seen, as opposed to the pure timing in other fishing minigames. Some unique elements, like the ability to invest in various stock markets to make a profit, are also unique to Castaway Paradise and help it to stand out in several ways from the titles that inspired it. As your hour count continues to rise, however, you’ll start to see some of the limits in the game’s activities. For example, there’s a constant stream of daily quests and quests from the game’s characters to complete, but these often boil down to fetch quests or objectives that repeat themselves. The daily quest mechanic, while a great idea, still seems to be bugged after the most recent patch. The counter will often show several hours left on the clock, but the quests will reset themselves seemingly at random. The inventory system will also begin to wear on you. While it functions just fine, the organization is odd. You can spend in-game currency to buy items, for example, but these are peppered throughout items that you do own, resulting in accidental purchases. While catching bugs and fish is also really fun, there’s a lack of information as well for players who need to get specific ones. For example, planting flowers attracts bugs, but I wasn’t ever able to find a guide that told me which flowers attract specific species. The same goes for fish bait, which comes in several forms, but doesn’t specify which type of fish it will attract. This kind of information would go a long way towards helping players progress through the quests, as you can only have three at a time. If the developers are able to iron out some of these bugs and perhaps tweak the way inventory is organized, this would go a long way towards making the experience as user-friendly as it looks. At the end of the day, Castaway Paradise is really fun, but the mechanics lack enough depth to really carry it through, and the lack of new characters to interact with once you’ve unlocked everything also means that you’ll need to wait for seasonal events to experience any real changes to the gameplay loop. Castaway Paradise has a bright and beautiful art style that looks similar to the games it takes inspiration from, while also capturing that island feel that makes it so charming. An upbeat soundtrack and some genuinely funny dialog also contribute to the game’s unique identity, despite it having a lot of similarities to other titles. While it may not be an Animal Crossing killer, Castaway Paradise does offer a fun and addicting slice of life that will carry you for many hours. Even though it’s expiration date will differ depending on how quickly the mechanics wear thin for you, there’s no denying that you’ll get your money’s worth and then some.